The face of the RazorGage-ST becomes an extension of the fence on your saw. T-slots in the bottom of the extrusion (units may be flipped to work on either the right side or left side of your machine) accept standard carriage bolt heads for mounting to a bench, a flat table or onto the back of a roller table using optional "L" brackets. A powerful microprocessor controlled drive motor precisely controls the position of the carriage through a steel reinforced cogged belt. 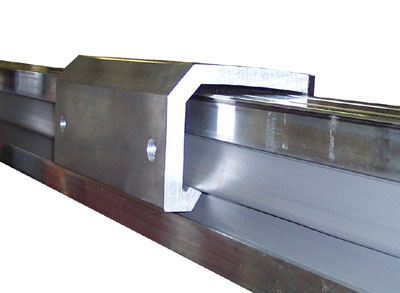 The carriage assembly consists of two bearing blocks fixed together riding on a precision ground hardened steel linear rail. This design overcomes wear and accuracy problems associated with friction-fit plastic guides used by other designs on the market. Our industry leading software runs on Microsoft Windows XP. 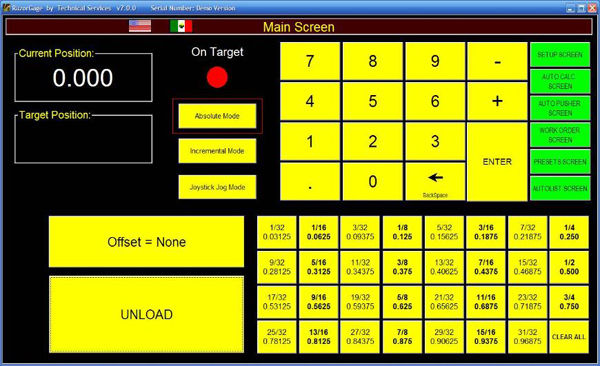 Your operator controls the RazorGage using a 15" color touch screen. Touching two or three "buttons" on the screen will command an immediate move to a position accurate to within the thickness of a piece of paper. Note that we use the word "accurate" rather than "repeatable". You are buying an automated positioner to get accurate part dimensions. Be sure you understand the difference. AutoList is our optional optimizing software that will turn your operation green and typically cuts down at least 30% of the waste material compared to manual "best fit" processes. Downloading your cut list is easily accomplished using our free Parts List Processor software and the built in networking port or a USB flash drive.